Early-80s band on the legendary 99 Records label. Often namechecked because of the track "Cavern" from which parts were replayed by Grandmaster Flash & The Furious Five for their hit single "White Lines". 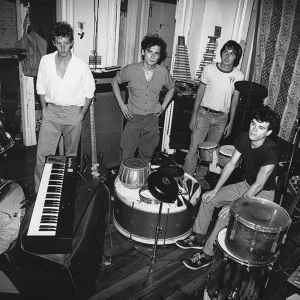 Liquid Liquid were originally a much more experimental sounding band called Liquid Idiot who released one 7" before reforming as Liquid Liquid and basing their sound around a much more percussive framework. They would invite members of the audience to bring their own percussion to their gigs and at one of these, they were so impressed when Dennis Young brought a marimba that they invited him to join. They developed their own unique sound which they called 'big beat' (a term some English producers would use more than a decade later for something entirely different). Liquid Liquid still exist and worked together with DFA on new material. History in the making Part 2...I was fortunate enough to see Liquid Liquid LIVE at Optimo in Glasgow in July. Twenty years on their performance was outstanding, the atmosphere in the club was electric and if you ever get the chance you MUST check these guys out!